It was our first festival back in in our hometown and it's safe to say it certainly didn't disappoint. Myself and my fiancee joined a group of friends to dance the day away in the pouring rain and sweltering sunshine - seriously we experienced severe weather through out the day. Located at the beautiful Wollaton Park - home to Batman, in case you hadn't already read hehe - Splendour Festival hosts five stages that cover a range of music, entertainment and comedy. The Main Stage, Confetti Stage, Funhouse Comedy Stage, Fringe Stage and Acoustic Rooms. The thing I love about this festival, compared to others I have been to, is that it is relatively small and so you are able to quickly switch between the main stage and confetti stage. 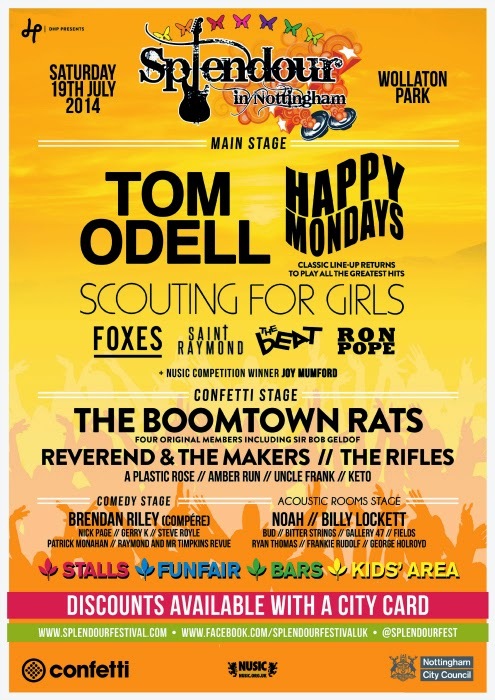 The best acts of the day for me had to be the charismatic Happy Mondays, followed by the spectacular Tom Odell. Rather than to a series of photos, I thought I would switch it up with two Vine videos of my day at Splendour Festival.